BETHLEHEM (Ma’an) — Arab MK [Member of Knesset or Parliament] Basel Ghattas said this week that threats by fellow Israeli lawmakers to remove his parliamentary immunity will not affect his decision to take part in the Freedom Flotilla III. The Israeli Knesset Committee reportedly voted in favor Tuesday of stripping Ghattas, a member of the Joint List– the Arab parliamentary bloc that won 13 Knesset seats in Israel’s last election– of his immunity from prosecution for joining the the protest flotilla. 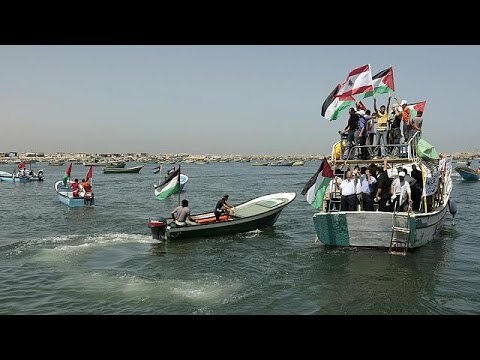 The Flotilla is the third of it’s kind to attempt to access the Gaza Strip by sea since 2010, aiming break the Israeli blockade with a convoy of ships carrying human rights activists, European lawmakers, Ghattas, and others. Israeli Culture and Sport Minister Miri Regev- member of Netanyahu’s Likud party- demanded earlier this week that Ghattas’ immunity be removed if he joined the flotilla. “We must end the use of the position of MK as a tool to undermine the government. Its time to instill order, and prevent Arab MKs from inciting against Israel,” Israeli news source Ynet reported Regev writing to an attorney general. Ghattas added that Jewish activists from around the world, especially Spain, will be taking part in the Freedom Flotilla III in addition to the previous Tunisian President Muncef al-Marzouki, members of the Algerian and Jordanian parliaments and several political and rights figures. In response to Israeli PM Benjamin Netanyahu’s vow prevent the flotilla from passing, Ghattas said that the flotilla is peaceful, free of arms, and cannot pose a threat to Israel, adding that the flotilla’s goal is to draw the world’s attention to the blockade and suffering of the Gaza Strip. Gaza has been subjected to an Israeli blockade for nine years, which includes a complete ban on ships entering or leaving the coastal enclave’s waters. In May 2010, Israeli forces staged a raid on a six-ship flotilla which ended in bloodshed, claiming the lives of 10 Turkish nationals and sparked a crisis with Ankara. Ghattas’ resolution to embark on the flotilla comes as several Knesset members have joined in to denounce his decision. “It is the gravest thing possible that an Israeli MP would join the flotilla whose aim is to help the Hamas terror organisation,” said Israeli Immigration Minister Zeev Elkin from the ruling right-wing Likud party earlier this week. “Israeli law does not allow anyone to serve in parliament who supports a terror organization,” he railed in an interview with army radio.